Our transfer arrangements were delivered to the room the night before our departure. We woke up and relaxed a bit on the patio before heading to lunch. We had a late afternoon flight, so our transfer time was right at lunchtime. We decided to have a later, large breakfast to hopefully hold us through lunch. You could also order to-go sandwiches and salads to take on departure from the hotel. The entire transfer process went just as smooth as our arrival to Nevis. There were free-flowing drinks on the boat back to the harbor and a quick taxi ride to the airport. Lines at the airport got long quickly as the transfers arrived since there were about 30-40 people from the resort on the same flight. Luckily, we were not checking bags and could zip through check-in and security. The only bad part of the process was the two hour wait until boarding. There was not much at all in the terminal – a few shops and cafe that seemed to be serving very slowly. It seems like the transfers could have left a bit later, but I understand not wanting to leave anything to chance with the number of people heading to the airport at the same time. Then we had two flights back to Chicago, a quick stop at the Admirals club, and the drive home, all of which which went smoothly. It is tough to say whether I would return to Nevis. I really enjoyed that Nevis did not feel like a tourist trap like you sometimes get at cruise ports. When we went to Sunshine’s and Turtle Time, there were both locals and tourists at the restaurant. Similarly, the hike to Nevis Peak and snorkeling was run by locals and not a big tour company which seems to always give a better experience. 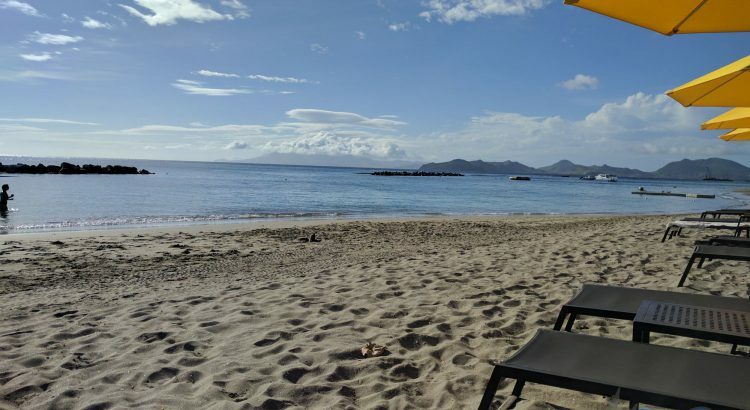 However, I am not sure if there is much more that I would like to do on a return to Nevis – maybe an island tour and bike ride. We can find similar beaches and resorts much closer to home and at a more reasonable price. All that being said, I definitely recommend a trip to Nevis. I think once the Park Hyatt on St. Kitts opens, there will be more options to use points to keep costs down. If we did decide to return, it would probably be to that resort for a new experience and to explore the island of St. Kitts.